Arroyo Grande Mayor Jim Hill and Oceano CSD Director Mary Lucey will make separate requests to censure one another at the South San Luis Obispo County Sanitation District board meeting on Wednesday. The district board consists only of Hill, Lucey and Grover Beach Mayor John Shoals. The agenda for Wednesday’s meeting lists Hill and Lucey’s requests as individual items. However, the district did not produce staff reports explaining the censure requests. 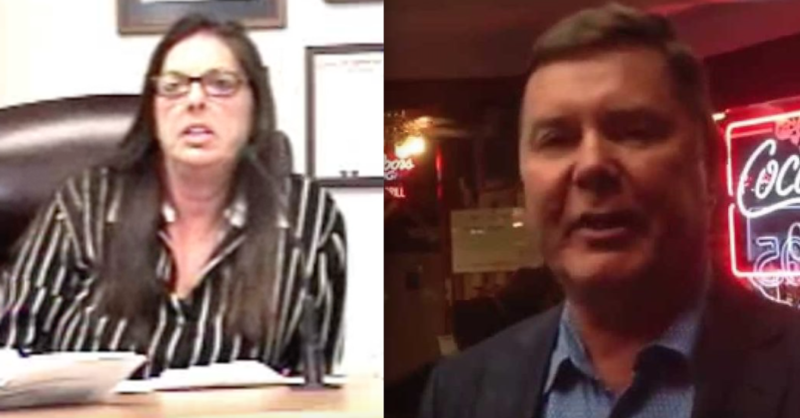 Hill’s request to censure Lucey reportedly came in response to a Sept. 10 Facebook comment in which the Oceano board member attacked the Arroyo Grande Mayor and called for a change in leadership in the South County city. Lucey posted the lengthy remark on the Facebook page of Arroyo Grande mayoral candidate Richard Waller, who is running against Hill in the November election. 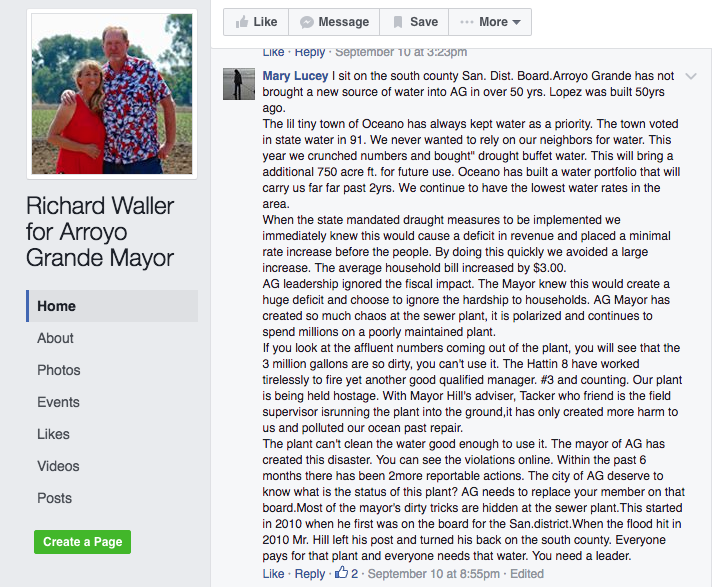 The post, which is rife with spacing errors, criticizes the city of Arroyo Grande’s management of its water supply, while praising Oceano’s handling of water issues. Lucey then goes on to accuse Hill of creating chaos at the South County sewage plant. However, under former plant administrator John Wallace chemical costs ran about $600,000 a year and the plant had multiple violations for releasing contaminated water into the ocean. In 2013, Wallace stepped down amid allegation of mismanagement lodged by Hill and several others. Since then, the cost of running the plant was reduced by almost half and the plant discharges have been cleaner. Lucey reportedly made her request to censure Hill after being informed he was seeking to censure her. A majority vote is presumably required for the board to censure one of its members. Well last night was an ugly s#%t show, with John Shoals as useless ringleader. I personally would like to thank Mary Lucey for NOT running for election again. Pretty sure Oceano is happy about it, as well as the staff at the SSLOCSanDistrict. She is a cancer of a particularly virulent and nasty strain. Shoals, the attorney, or even the GM of the plant. Not a drop of action or leadership among them last night. Yet more neener, neener at taxpayer expense. I think adult time-outs should be mandated. In my day we duked it out in the playground and never made headlines. Ms. Lucy is the poster girl for the dissolution of all CSDs in the county. Brought to us via the Brown Act CSDs have had the effect of a recession on SLO County. The blight of no growth becomes more apparent as each year goes by. This problem arises because of the complete ineptness inherent in CSDs due to the pitifully small population from which CSD members must be draw from. Virtually any wack job could well become a CSD member in these small towns. Its just a matter of getting members of your wack job click to vote you in, and most importantly this…it takes very few votes to vote one in to a CSD. Many times a CSD will be comprised entirely of localists who’s only interest is no growth, no way, no how. They are willing to destroy a town in this ugly endeavor. Jim Hill is an asset to this board and the city he represents. Ms. Lucey fancies herself as informed and important. She is neither. She denigrates and demoralizes staff, asks unintelligent questions and often makes comments which have no merit and are not based on fact. Her attempts to appear knowledgeable are laughable. She’s on record trying to humiliate the plant director while spewing about E-Coli, something never mentioned in his report. She is a liability to district ratepayers. No staff reports? Why not? Clearly Mayor Hill has made his evidence for request for censure known by attaching this nonsensical, libelous, attack on sanitation district staff, members of the public and himself available to the press. What’s not available for some reason, is Lucey’s request for censure of Mayor Hill. As a frequenter of both SSLOCSD and OCSD meetings I have not seen, nor heard, Hill say in person or in writing anything derogatory about Lucey. What grounds does she have to call for his censure? Does she even know what “censure” means? To fail to provide the information to the public ahead of the meeting is disingenuous to the spirit of “transparency”. If a majority of the board has seen it (that’s just two board members in this district), it is required to be automatically available to the public. So why is it not published as part of Wednesday’s staff packet? The public is left in the dark. “F”‘s all around; SSLOCSD Board President John Shoals, District Administrator, Gerhardt Hubner, and District Legal Counsel’s, Wendy Stockton and Gil Trujillo. “No staff reports” Not sure why but perhaps the SSLOCSD has the same problem Arroyo grande has, a staff with many wanting the old regime back. In Arroyo Grande some staff still wants Ferrara type leadership back, they enjoyed the favoritism, the hidden agendas and being on the side of those in charge and miss that since Jim Hill was elected. Maybe the SSLOCSD needs the same thing Arroyo Grande needs a staff cleaning.